I'm new to this KAL and I'm knitting my tank a bit late, as it's starting to get a bit too cool to wear it, but nonetheless, I'm forging ahead. I'm so impressed with everyone's work, and after starting my tank in the second size and ripping it all out after the second pattern repeat because it was a tent, I'm glad to have found others with similar problems. 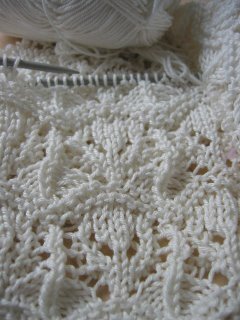 I'm now ready to start the armholes and I've read a lot of people have put short row in to give a bit of room in the front. 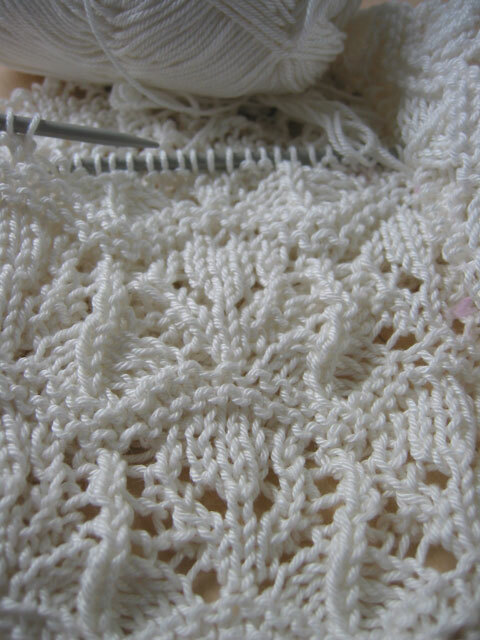 I'm knitting the smallest size and I'm a size 36", so I think I should be knitting some short rows too. Can anyone tell me how they knit the short rows??? I'm new to short rows so I don't really know what to do. oh, that's a lovely photo! i was new to shortrows too before this project. i found the video on knittinghelp.com the most helpful, though some people recommend the knitty guide as well. -gorgeous! what are you using for yarn ? I'm using a very inexpensive mercerized cotton 125m/50gr. I've used this before for my kids' sweaters and love the feel of it. It also washes well.